Our backyard is bathed with afternoon sun, which is also usually the time when we gather with friends and family. So, by around 5:00 o'clock, the mighty sun will be in our eyes while we gather al fresco. For awhile now, I've been thinking of how to address this opportunity. I call it opportunity because it gives me a chance to get creative, think, put my brain cells to work, and execute a plan. Thanks to Tommy Bahama and Costco, they made these beach umbrellas available for about $25 each. Next stop, Wal-Mart...for the huge resin planters at around $28 each. 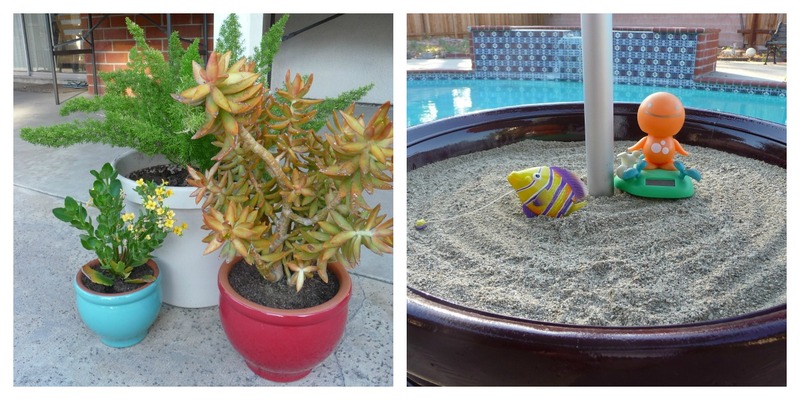 Given that these are beach umbrellas, I filled up the planters with sand. So off to a construction supply I go and bought 48 shovels of sand which cost me around $18. So, for about $124 (before tax), I was able to address this opportunity. What do you think? 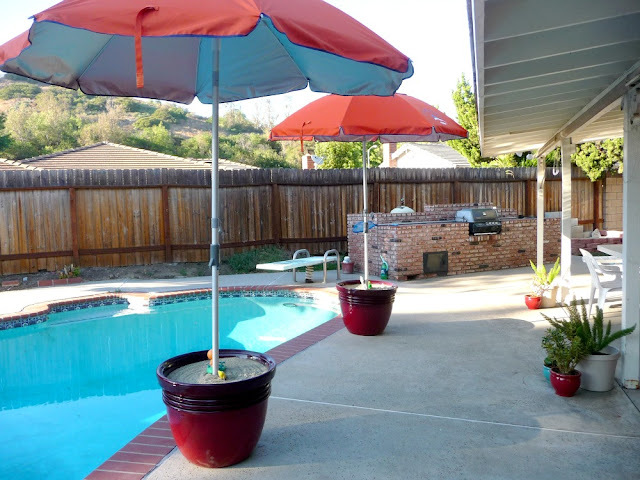 What I like about these umbrellas is that they are 7 feet tall, and the top tilts so you can angle it depending on the position of the sun. It also has a vent at the top to allow for airflow, so the umbrella does not topple when the wind blows upward into it. My solution allows for the planters to move to whatever location you want to bring the umbrella to. Since the sun moves, you can just move along with the sun and still have shade. This sand planter is very heavy. You will need two people to scoot this onto a flat hand truck if you ever want to move it. I've had these plants for a while now, but they were still in their black plastic pots from the nursery. So, I quickly ran to Home Depot to buy the red and teal pots to match the big planter holding the umbrellas. These pots are glazed clay pots. I grouped them into three in three differently sized pots. The tall one in the back is a plastic pot that I already have, and it is now home to Asparagus Fern or Myers Asparagus. 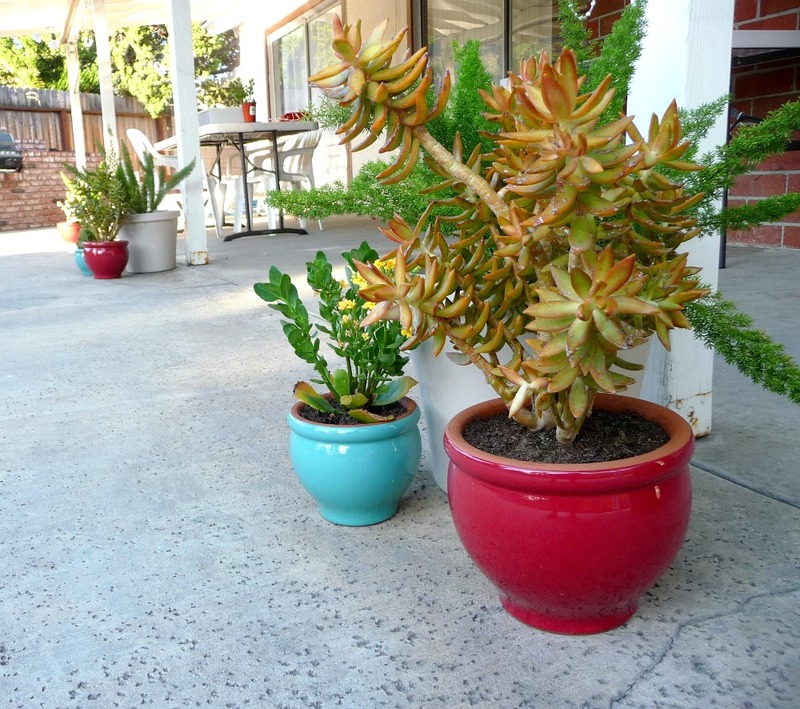 The red pot contains Sedum Coppertone, and the teal pot contains Kalanchoe. I decided to put this grouping in front of three of my patio posts.